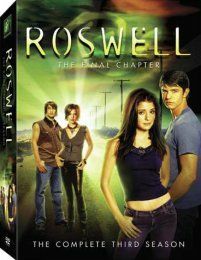 The town of Roswell, New Mexico, has been haunted for decades with accounts of a looming alien presence. 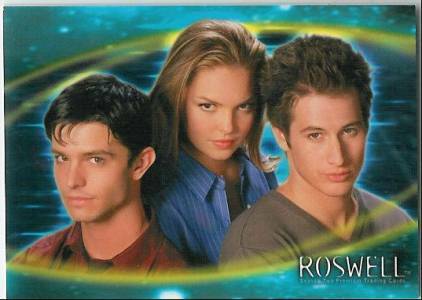 The popular television series ROSWELL takes that concept one step further, as aliens become everyday teenagers. Four alien-human hybrids ,Shiri Appleby, Jason Behr, Katherine Heigl, Brendan Fehr,have been sent to Earth to wait for the day when they'll return to their planet and save their race. But for now, their battles are the everyday struggles that normal teenagers must face. 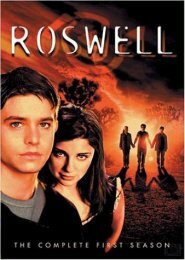 Blending straight drama with elements of sci-fi, ROSWELL is an engaging drama that works on numerous levels. Includes new cutting-edge songs selected by the original Roswell music team. craft was nothing more than a weather balloon. But producers David Nutter and Jason Katims arespinning a new angle on the story in Roswell.They reveal that not only did aliens dive bomb into the American west 50 years ago, but their descendants are living among us under the guise of human personas.One of the exciting things about the premise of the show is that the three alien characters in the show don't know about their history. It's exciting as they discover their backstory, the audience is discovering it. 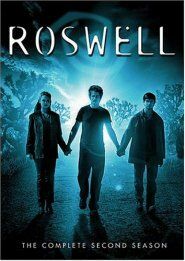 Although it would be easy to define Roswell as a science fiction program, Katims and Nutter have opted to steer away from the sci-fi aspects and focus more on the quest for identity and acceptance. 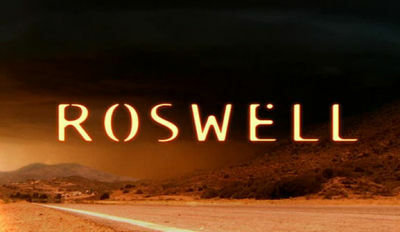 The stories will be told from the point of view of the human residents of Roswell, but will also call upon the unique voice of the aliens. It is they who must struggle to conceal their otherworldly identities while discovering what it means to be human. Max, Isabel and Michael struggle to keep the secret they having been living with for all of their lives after Max saves Liz's life. He uses his powers in public to heal her after she is accidentally shot in the Crash Down cafe. The numerous witnesses to the event see questions being asked about what exactly happened on that day and how the bullet that hit Liz and the wound it caused disappeared. Initially their problems are limited to the local Sheriff who had grown up with an alien obsessed Sheriff as a father. Despite spending years resisting his fathers beliefs, the Crash Down shooting and the increasing number of inexplicable events see this view change. Things spiral out of control as the FBI takes an interest in the Crash Down case and assign specialist from their top secret alien hunter unit to investigate. The introduction of a fourth alien, from whom they were separated at birth, and Nasedo, a guadian of the royal four, gives them further hope. Things take a turn for the worse as the government close in on them all. Max is taken by the alien hunting branch leader. A daring rescue plan is launch which exposes Max, Isabelle and Michael along with those helping them. 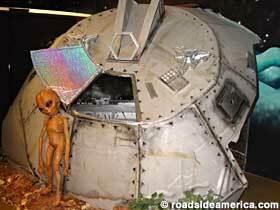 In the summer of July 1947, something crashed close to Roswell. " Mack" Brazel, a rancher in New Mexico, got his horse and rode out with some neighbors to check on his sheep after a crazy thunderstorm the night before. As they rode along, Brazel began to notice unusual pieces of what seemed to be metal debris, scattered over a rather large area. As he looked more into it, Brazel saw that a shallow trench, several hundred feet long, had been etched into the ground. Shocked and curious Brazel took a peice of the debris back home to his shed. After sharing the unknown object with his neighbors they suggested he go and tell the sheriff about his find.After Mack had delivered the news to Sheriff George Wilcox, he then reported it to Intelligence Officer, Major Jesse Marcel of the 509 Bomb Group, and for days, the debris site was closed while the wreckage was cleared. On July 8, 1947, a press release was stated that the wreckage of a "crashed disk" had been recovered and was issued by Lt. Walter G. Haut. The Roswell UFO unidentified flying object incident was the alleged recovery in 1947 of at least one alien space craft and its occupants near Roswell, New Mexico, USA.Debris was recovered from a ranch near Roswell in early July 1947, and the Roswell Army Air Field issued a press release stating that a “flying disk” had been discovered, sparking intense media interest. Within hours, a retraction was issued claiming instead that a weather balloon had been recovered, and a subsequent news conference featured debris said to be the object which seemed to confirm the weather balloon description. The case was quickly forgotten and almost completely ignored, even by UFO researchers, for some 30 years. Then, in 1978, Stanton T. Friedman interviewed Jesse Marcel, who was involved with the original recovery of the debris in 1947, and Marcel expressed his belief that there had been a cover-up of the recovery of an alien craft. His story started to be told in UFO circles, including in the documentary “UFOs Are Real.” In February 1980, an interview with Marcel appeared in the National Enquirer, bringing the story national and worldwide attention. Additional witnesses and reports emerged over the following years. They added significant new details, including accounts of a large military operation to recover alien craft and aliens themselves, as many as 11 crash sites, and intimidation of witnesses. In 1989, former mortician Glenn Dennis revealed a detailed account which included alien autopsies carried out at the Roswell base. In response to these reports, and after political pressure, the General Accounting Office launched an inquiry and directed the Office of the Secretary of the Air Force to conduct an internal investigation. The result was two reports. The first one, released in 1995, concluded that the material reported recovered in 1947 was likely debris from a secret government program called Mogul. The second report, released in 1997, addressed the reports of aliens and concluded these reports were likely transformed memories of the recovery of anthropomorphic dummies in programs like Project High Dive, conducted in the 1950s. The psychological effects of time compression and memory contamination explained the discrepancy with the years in question. These reports were dismissed by many as being either disinformation or simply implausible, though significant numbers of UFO researchers discount the probability that any alien craft was in fact involved. 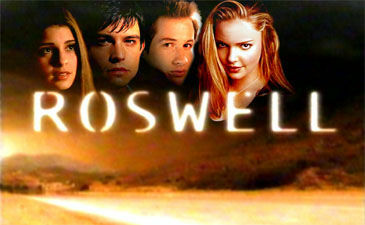 Today, “Roswell” is almost synonymous with “UFO,” and likely ranks as the most famous alleged UFO incident. But there are widely divergent viewpoints on what actually happened, and passionate debate on what evidence can be believed or discounted. It is therefore difficult to assemble a sequence of events which will avoid strenuous objection from one side or the other. Newly discovered documents reveal that in the months immediately following the purported 1947 UFO crash at Roswell, secret government studies began on a material that was previously unknown to science. The "memory metal" that was studied precisely matches some of the debris material reported by several witnesses to the crash. Evidence shows that -under military direction- these unique metal studies were undertaken by a contracted laboratory that possessed advanced technical capabilities that the U.S. government itself did not have at the time. A former high-level scientist employed by the involved laboratory has offered a confession that he was tasked to study the crashed UFO material. Information provided by two U.S. Air Force Generals also offers direct support for this discovery. The documents suggest that after the crash, the US government attempted to develop a unique material that is today referred to as memory metal. This shape-recovery alloy was reported by several witnesses to the Roswell crash in the summer of 1947. The lightweight "morphing" material was able to be crumpled or deformed and then return itself instantly and seamlessly to its original state. The metallurgical discoveries that resulted from these studies were then "seeded" for further technology development to other government agencies (including NASA) and through a series of military contracts to universities and industry. The laboratory contracted by Wright Patterson Air Force Base to perform these studies was Battelle Memorial Institute in Columbus, OH. It has been credibly reported that Wright Patterson Air Force Base was the very base where the Roswell UFO debris was flown after the crash. Newly discovered documents reveal that in the months immediately following the purported 1947 UFO crash at Roswell, secret government studies began on a material that was previously unknown to science. The "memory metal" that was studied precisely matches some of the debris material reported by several witnesses to the crash. Evidence shows that -under military direction- these unique metal studies were undertaken by a contracted laboratory that possessed advanced technical capabilities that the U.S. government itself did not have at the time. A former high-level scientist employed by the involved laboratory has offered a confession that he was tasked to study the crashed UFO material. Information provided by two U.S. Air Force Generals also offers direct support for this discovery. The laboratory contracted by Wright Patterson Air Force Base to perform these studies was Battelle Memorial Institute in Columbus, OH. It has been credibly reported that Wright Patterson Air Force Base was the very base where the Roswell UFO debris was flown after the crash. Recently obtained documents reveal that these studies for Wright Patterson were conducted at Battelle under the direction of Dr. Howard C. Cross. In the late 1940's, H.C Cross was Battelle's expert scientist in exotic metallurgy and Titanium alloy research. Curiously –although he was a research metallurgist- Cross was also Battelle’s "point person" in later studies on UFOs that Battelle conducted in the early 1950's for the U.S. Air Force's official UFO study, Project Bluebook. Cross is likely an author of Project Bluebook's still-missing Report Number 13. He is also the author of a strange letter from Battelle to Wright Patterson known as "The Pentacle" memo. Dr. Cross' historic role will be detailed in a forthcoming article. Founded in 1929, Battelle is engaged in research, development and commercialization of technological innovation. They specialize in materials science and engineering, life sciences, energy science and national security. Battelle contract operates many of our country's National Laboratories. This includes some of the U.S.'s most sensitive installations such as Oak Ridge, Lawrence Livermore and Brookhaven laboratories. Battelle is headquartered in proximity to Wright Patterson- and remains one of the nation's leading defense contractors. Their metallurgical capabilities and technical talent continue to be recognized as world-class. THE DEBRIS AND MEMORY METAL The full story of the Roswell-Battelle connection is related in the newly published sequel book "Witness to Roswell " (Revised and Expanded Edition, 2009) by Tom Carey and Don Schmitt in chapter contributions made by this author. Scientific citations, references and report images are also included in this updated edition. The direct connection between the Roswell debris and the Battelle studies is revealed in a material known as Nitinol.Nitinol is a specially processed combination of Nickel and Titanium, or NiTi. It displays many of the very same properties and physical characteristics as some of the crash debris materials that was reported at Roswell. Both are memory metals that "remember" their original shape and both are extremely lightweight. The materials are reported to have similar color, possess a high fatigue strength and are able to withstand extreme high heat.Today Nitinol is incorporated in items as far-ranging as medical implants and bendable eyeglass frames. It is produced in many forms including sheet, wire and coil. Newer "intelligent metal" systems are being studied by NASA in the creation of bendable or flappable wings, as self-actuators and as a "self-healing" outer hull "skin" for spacecraft. 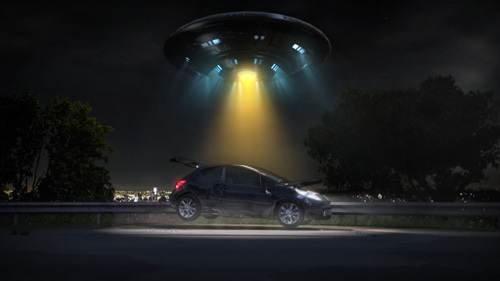 It is believed that the memory metal found at Roswell came from the outer structures of a downed extraterrestrial spacecraft.The earliest known combination of Titanium and Nickel reported in the scientific literature was in 1939 by two Europeans. However, this crude sample was a "by-product" of research entirely unrelated to the study of Nitinol. Its "memory metal" potential was not sought or noted. The scientists would have been unable to purify Titanium to sufficient levels at that time-and they would not have known about the energy requirement needed to create the "morphing" effect. The next time that we see the unique combination of Titanium and Nickel emerge in science is by military scientists associated with Naval Intelligence at the US. Naval Ordnance Lab. It was there that Nitinol was "officially" created in the early 1960s. But Nitinol's "official" history including the date and reasons for discovery- is conflicting. More on this murky history will be detailed in a future article. Recently gained information suggests that it was in fact Battelle's metallurgist and UFO researcher Dr. Howard Cross who "fed" the US Navy information ,including the “phase diagram” and details on Titanium processing,that is required to create Nitinol. Research by this author has confirmed that Nitinol studies actually began at Battelle immediately after the Roswell crash -and not in the early 1960s. And it was Wright Patterson the base where the crash material was flown that contracted this secret work.This confirmation is given in a brief footnote found in a study by one of Nitinol's "official" inventors at the U.S. Naval Lab. In that military report on Nitinol, the author footnotes a 1949 Battelle study which clearly pertains to the refinement of Titanium and Nickel. The citation relates to a "phase diagram" that examines states of matter and how the two metals could be successfully alloyed. If processed in the right way, the result is Nitinol memory metal. It is possible that the “official” co-inventors of Nitinol were unaware that the memory metal’s impetus was to be found in the study of the Roswell debris- or perhaps not. Wright Patterson needed Battelle to accomplish this work. Much of the reason for this is because Battelle had something that Wright Patterson did not- an advanced arc furnace that was capable of melting and refining Titanium to the purity required to make memory metal.The history of Titanium which is required to make Nitinol is itself also very revealing. We learn through review of the literature that, according to Encyclopedia Britannica: "After 1947, Titanium changed from a laboratory curiosity to an important structural metal." According to the Industrial Arts Index, the number of science abstracts published on Titanium spiked dramatically from 1946 and prior years, as compared to abstracts on Titanium written after 1947. In Rand Corporation's 1962 abstract "The Titanium Decade" we learn that: "A far larger Titanium industry arose from the point of view of production capacity than was needed to produce the material that was actually used in aircraft. The time period of 1948-1958 involved virtually all of the costs." An astonishing $2.5 billion (in today's dollars) was spent on Titanium research by the US government in the years immediately following 1947. The Battelle memory metal report is titled "Second Progress Report on Contract AF33 (038)-3736" and was completed for Wright Patterson Air Force Base in 1949. It is authored by C.M. Craighead, F. Fawn and L.W. Eastwood. It appears to be part of a series of such contracts conducted through the early 1950s. Interestingly, the scientists who authored the report were very closely associated with Battelle's chief Titanium metallurgist and later, Battelle's UFO researcher for Project Bluebook, Dr. Howard Cross, previously mentioned. The scientists went on to author reports on exotic metallurgy that related to such areas as "metal and superplasticity," "metal transformation," and "metal microstructures." Based on the sections of the studies that were found that reference this Battelle report- we know that this “progress report” offers the first “phase diagram” ever produced to attempt to successfully alloy Titanium and Nickel. This would be required to make memory metal. We can also infer that it examined refinement of Titanium to high purity levels. High purity Titanium is required to create the shape-recovery effect. No references have ever been located to something that must surely exist- Battelle's "First Progress Report" on the memory metal. While the Second Progress Report completed in 1949 ,refers to techniques to process the alloy, the First Progress Report authored in 1947 or 1948, probably relates to the actual analysis of "Roswellian" memory metal. Although Nitinol is not identical to the Roswell debris material, it represents our best attempts at re-creation of the found memory metal. The impetus for this "shape-recovery" metallurgical research has to be the crash debris discovered at Roswell in the summer of 1947. Battelle's own Historian ,Librarian was unable to locate the documents. In a later follow-up call to Battelle, Sarasota Herald Tribune reporter Billy Cox was told that Battelle is still unable to find the report and that it remains a "mystery." Likewise, Wright Patterson Air Force Base's own Archivist and Manager of its Special Collections was unable to locate the documents. Both librarians from each organization worked together to find them. They are baffled and suggest that it may mean that the reports were destroyed though there is no record of this or that they may remain highly classified. The U.S. DOD's Defense Technical Information Center (DTIC) is the master repository of our nation's military-sponsored technical reports and studies. Their database also fails to locate the Battelle reports. Finally, with the guidance of reporter Billy Cox, a Freedom of Information Act (FOIA) request to the Secretary of the Air Force/WPAFB was filed by this author. Information has yet to be provided that is responsive to this request. It is hoped that the Second Progress Report will one day be located. This is because if it does contain "phase diagrams" for the alloying of Nickel and Titanium- it will confirm the work on memory metal. It would strongly suggest that shape-recovery alloys were precisely what Battelle was attempting to create for the military in the time period directly after the Roswell crash. The likelihood that the First Progress Report by Battelle on memory metal will ever be found is even more remote. In an interview conducted in the 1990's, former Wright-Patterson Air Force Base Brigadier General Arthur Exon confirmed the existence of the Roswell metal reports. Exon, the Base Commander of Wright Patterson in the 1960s, related that he was privy to some of the details on the composition of the crash debris and the variety of tests that were performed on it. "It was Titanium and some other metal they knew about, and the processing was somehow different." Of course, special "processing" of Titanium and the “other metal” that “they knew about” Nickel is required to create Nitinol.Exon added tellingly, "And it wouldn't surprise me if the material wasn't still around, certainly the reports are." Exon was likely referring to the Battelle Progress Reports on memory metal done for Wright Patterson in the late 1940's. Air Force General George Schulgen (who led Intelligence at the Pentagon at the time of the Roswell incident) authored a previously-marked “secret” draft memo on the flying saucer issue on October 30, 1947- about four months after the crash. In the verified version of this memo is found a section entitled "Items of Construction." Schulgen instructs his officers to be aware of flying objects and their materials of construction. He specifically notes the "unusual fabrication methods to achieve extreme lightweight" and that the material is of a "composite construction...using various combinations of metals." Schulgen is describing precisely some of the very characteristics of Nitinol. Just like the Roswell debris material, it is an "extreme lightweight" intermetallic alloy. As a novel "composite construction," it is created by an "unusual fabrication" method that "uses a combination of metals"- perhaps like Titanium and Nickel. Battelle scientist Elroy John Center has stated that he analyzed metal from a crashed UFO when he was employed by the Institute. Center was a Senior Research Chemist who worked for Battelle for nearly two decades, from 1939 to 1957. This has been confirmed by both his University of Michigan alumni files and by the location of scientific papers that he authored during his employment while at Battelle. A graduate Chemical Engineer, Center authored papers that appeared in highly technical journals. His areas of research included the chemical testing of metals; the microdetermination of metals in alloys; and the spectroscopic analysis of unique materials. Center was likely involved in early analysis of the Roswell debris. A groundbreaking metals analysis technique that Center developed has been found cited in studies related to the “polygraphic determination of Titanium” in alloys. Specially-selected Titanium is required to create the Roswell-like "memory metal" Nitinol. Center's family members confirm that he had an intense interest in UFOs and the extraterrestrial. In May of 1992, noted historical researcher Dr. Irena Scott of Columbus, OH (herself a former Battelle scientist) interviewed a close professional associate of Elroy Center. Elroy had privately related to him in June of 1960 that while he was employed at Battelle he had been involved in a very strange laboratory project. Center said that earlier he had been tasked by his superiors to assist on a highly-classified Battelle study that was contracted by the government. He said that the project involved work on a very unusual material. 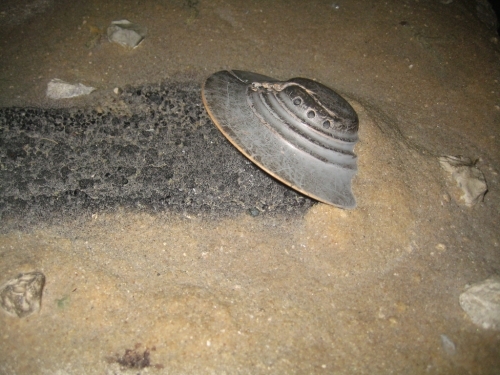 Center understood that this debris material was retrieved by the US government from the earlier crash of a UFO. Center referred to the item he studied as a "piece." He explained that this "piece" was not something with which anyone was familiar. He also said that the debris had been inscribed with strange symbols that he called "glyphics." Similar markings have of course been reported by some of the witnesses to the Roswell crash debris. Center stopped short of providing any further details. The Battelle scientist passed away in 1991.